An electromagnetic pulse (EMP) weapon detonated over North America’s atmosphere could strike everything within its line of vision, overheating vital transformers and ultimately taking out that region’s electric grid, leaving the population vulnerable to cyber and physical attacks and threatening the very lives of large portions the population. The United States and Canada are apparently doing nothing to prepare for such an attack, argues author Anthony Furey. This month, Furey released his book Pulse Attack: The Real Story Behind the Secret Weapon That Can Destroy North America on Amazon. The book is the first of its kind to outline the A-Z effects of a potential EMP attack on North America and suggests several simple ways to protect against such a devastating scenario. In an exclusive interview with Breitbart News, Furey explained that his motivation for writing Pulse Attack is to generate awareness about this important topic and to help the public understand what this issue is. He said such an attack, used as a piece of warfare, may disable civilization. “Right now the issue is more urgent than ever with North Korea on the rise and being emboldened,” Furey said. 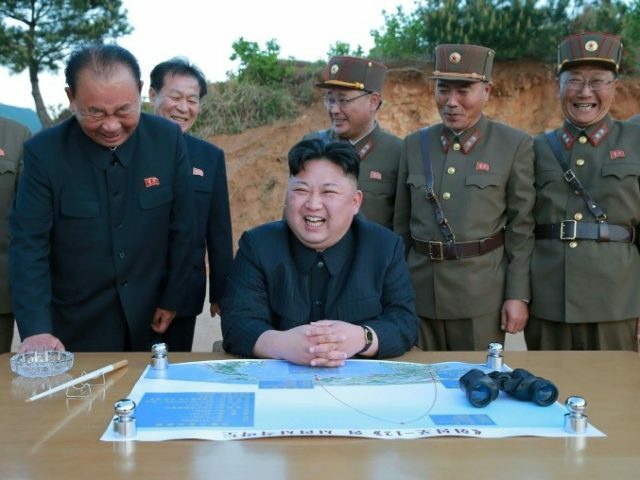 “While North Korea, as you know, doesn’t always succeed to the level they want – some of their tests aren’t overtly successful – they are still making progress.” He added, “Everything they do, even if it’s a failed launch, is them learning more information” about how to carry out an EMP attack. Furey noted that it would be easier for North Korea to, in some respects, develop an EMP weapon over a nuclear weapon. “An EMP weapon requires a much smaller kiloton yield to get off the ground,” he explained. While much of the media reported North Korea’s nuclear and missile tests as “failures,” it is possible these tests were actually successes, if testing for something other than explosive ability. North Korea threatens to wipe out the United States on a regular basis through its state media. An EMP attack can be caused by the sun, by a nuclear EMP (NEMP), or a non-nuclear electromagnetic pulse (NNEMP). Furey told Breitbart News that, when these waves hit the earth’s surface, they have the ability to take down our water filtration systems, regional food hubs, communication networks, and the financial industry. “We live in an increasingly fragile civilization where we rely on electricity for absolutely everything,” he said. Such an attack could also destroy our transformers and result in the very way we create electricity to be taken off the grid for up to one year. When the sun releases what is known as a coronal mass ejection (CME), it has the same effects as an EMP attack would. In September 1859, a geomagnetic superstorm, known as the Carrington Event, was the first documented solar coronal mass ejection (CME) to hit the earth’s surface. It resulted in severe storms and disruptions in the earth’s atmosphere. The incident became known as the Carrington Event, after an English scientist, Richard C. Carrington, who made the discovery. Several years later, in 1989, another geomagnetic storm caused by a CME blacked eastern Canada out for hours and inflicted billions of dollars in losses. Then, in July 2012, one of the strongest solar storms in recorded history, a double CME, narrowly missed Earth. Scientists have suggested that this storm may have been stronger than the Carrington event. According to the National Academy of Sciences, a similar storm taking place today would result in over $2 trillion in damages; that’s 20 times more than damage incurred from Hurricane Katrina. One year after the 2013 Metcalf attack took place, retired federal regulator Jon Wellinghoff said it was “the most significant incident of domestic terrorism involving the grid that has ever occurred” in the U.S. Protecting North American’s electrical grid against the most devastating consequences of an EMP disruption or attack is simple and would require, at its most basic, a minimal amount of resources. “The solutions are actually within reach, and they are easy,” Furey noted. As little as 8 cents per month (less than $1 per year) charged to each residential electricity consumer over the course of five years could be enough to provide the basic national safeguards for our electric grid. The GRID Act and SHIELD Act have been sitting in both the House and Senate. Unfortunately, powerful special interest groups have lobbied against this funding solution to an entirely non-partisan issue.